I read with interest Kit Withnail's blog about the Big Issue earlier this week - which he described as "one of the most foul and conservative institutions working in homelessness in the UK". Kit takes issue with the ethos, while making some very good points about attitudes towards homelessness and sleeping rough. What struck me in the interview was that this was someone running a business - indeed it was constituted as a company. I was informed that, at the time, the Big Issue in the North had a £3 million annual turnover, it had 40 employees, it had a chief executive with a company car, it had nine years of trading history, sold 60,000 magazines per week and had a £200,000 profit margin (40% of which came from advertising revenue). What in effect this means is that a professional staff produces a magazine subsidised by the homeless vendors, who seemingly have no right to the minimum wage, and are not employed, so no health and safety protection, no paid leave, etc. Remember they're 'working not begging'- but they're working with no rights, at sub-poverty wage levels and are supporting a paid infrastructure of writers, printers, editors and admin staff. I have no hesitation in calling that exploitation. It calls itself "a business solution to a social problem". Except what does it solve - not homelessness (how could it - when it doesn't provide housing?). The problem I have with the Big Issue is the same one I have with David Cameron (who is guest editing the next issue of the London Big Issue) and his Big Society. It's not a solution, it's a rather poor sticking plaster that moralises over the problem rather than addressing it. The cold reality is that charities and businesses cannot solve the severe social problems that capitalism causes. More than that, they neither have the power nor the intention to do so. So while politicians are destroying the welfare state (especially social security and council housing) more and more people are going to be subject to the whim of these business solutions, social enterprises or Big Society organisations. It would be wrong to think this process began with the coming to power of the Tory-led coalition government. Labour created a social enterprise minister, and ministers promoted the concept, like Hazel Blears and Liam Byrne, who said shortly before leaving government, "In a climate of spending cuts and a need to reduce the budget deficit over the next few years, social enterprise has a huge role to play in delivering public services". I don't deny that the Big Issue and other charities, social enterprises or social businesses can do some good and do help some people. But to pretend they are either 'the answer' or a solution is ludicrous. Unless that solution is to make more comfortably off people feel better about themselves. Then it is, as the CPGB once put it, no more than "a hypocritical belch of the well-fed bourgeoisie". *By the way, unlike the man in the photo Big Issue vendors are instructed to stand to sell the magazine. GDP figures today show the economy grew by a pitiful 0.2% in Q2 of 2011, throwing the OBR's growth estimate way off course - meaning Osborne must now focus on growth (but more likely will announce more cuts to deal with an expanding deficit). In advance of the formal announcement, commentators had been expecting GDP growth to be within -0.5% to 0.5%. This in itself tells a story. Low expectations reflect the failure of George Osborne's economic strategy - his cuts have suppressed growth, as well as causing the inevitable misery: pain without the gain. All of this has been entirely foreseeable and predicted. Those on the left have rightly argued that unemployment is the main issue Osborne should be addressing, rather than his deficit obsession. Like my Nan used to tell me 'take care of the pennies and the pounds will look after themselves', a new maxim should be 'take care of unemployment and the deficit will take care of itself'. Osborne's failure to create jobs and growth domestically is being compounded by the failures elsewhere in the world. The eurozone (always unviable IMO) is floundering as the reality of one monetary policy for such clearly different and divergent economies is made clear. Nevertheless there are some common truths for those countries most in crisis: the first being routine and endemic tax evasion and avoidance; the second being the deregulation of the finance sector; and the third, and least commented on, being an absence of manufacturing base in the economy. This latter point is now being exacerbated by the growth of the BRIC countries (Brazil, Russia, India and China) particularly the latter. The effect on Europe and North America to the new reality of China as a major manufacturing economy (and the other three also catching up) is huge - and has the effect has been exacerbated in the US due to NAFTA, which had already decimated US manufacturing industry. In the UK, manufacturing has dropped by 9% since 2008 Q1. With none of the three issues: tax justice, financial regulation and manufacturing policy at the heart of any western government's programme, the future economic prospects look bleak however today's GDP figures are spun. * Royal Wedding - a final word on the frippery ... in November 2010, the Telegraph reported that the Royal Wedding would boost the UK economy by as much as £620 million. When retail sales figures were published previously, and GDP figures today, the consensus switched to blaming the extra bank holiday for hitting the economy. The ONS today said "There were a number of special factors which may have affected economic activity in the second quarter, including the additional bank holiday for the royal wedding", but later says: "Sales in April may have been boosted by the royal wedding, before falling back in May". So the royal wedding as a special factor may have been a boost to the economy. Regardless, it's effect was minimal and Osborne's strategy is failing. Update: and back to a serious point, good analysis of the GDP figures and reasons for UK's economic malaise by Unite General Secretary Len McCluskey on the Guardian website, "there is no plan for growth beyond an entirely dogmatic trust in the private sector. The possibilities of, for example, using the state's stake in major banks to drive investment are simply ignored." 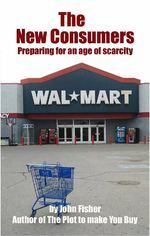 The New Consumers: preparing for an age of scarcity by John Fisher begins with a warning from George Santayana, "those who fail to learn the lessons of history are doomed to repeat it". Its central thesis is that our 'dominant social paradigm' in which "growth of any kind, in any section of our culture, is a social norm and probably a good thing" is fragile, on the verge of collapse. This is due mainly, but not exclusively it is argued, to the impending end of fossil fuels on which our societies have been so dependent. This may "bring about a rather sudden social paradigm shift which may be too compressed for our society to cope with without serious social consequences". The fault for this is 'inherent in the system' which "encourages only individual solutions to collective problems". This is nowhere better illustrated than in Chapter 1 of the book called 'The Way We Live' an account of the lives of fictitious suburban middle class couple Philip and Amy Thornton as they go about their daily business with their children: working, eating, shopping, resting at home, pursuing leisure activties, etc. Although the Thorntons live in North America, their situation is not too distant from much of the UK. This daily routine paves the way for the chapters that follow on Food, Shelter, Transportation and Energy. The rising cost of food has its root in global oil prices, but what cannot also be ignored is the extent to which prime farmland in North America has been concreted over for more lucrative commercial and residential use. Imports are often cheaper, and of course prime parts of African and Asian farmland are used to feed not themselves or even the West but to grow cut flowers, coffee, tea and tobacco. It quotes then environment minister Ben Bradshaw MP in a highly underpublicised speech, when he said that our "food production does just as much environmental damage as private transport and housing". Community supported agriculture is positively promoted, alongside an exposure of the tactics of the marketing executives for their deceptive labeling and the politicians who permit such lax regulation - and the author should know as a former high-flyer in Canada's equivalent of Madison Avenue, exposed in his prior book The Plot to Make you Buy. The housing chapter, 'Shelter' is begins with a fascinating history of the origins of North American suburbia, neatly summed up in the song Little Boxes. Like our food production and the prices we pay, this suburbia (far more widespread in, but not exclusive to, North America) is dependent on cheap fossil fuels - which provides a useful segue to the next chapter: Transportation. Again, the reader is eased in with the absorbing battle for city transport - and how the automobile industry fought a dirty war against the public mass transit systems that existed in many North American cities: the streetcars and trolley systems. The behaviour of National City Lines in 1930s, 40s and 50s is not to dissimilar to that of Stagecoach in the UK (which has recently purchased Coach Canada) since the 1980s when bus services were deregulated under the Thatcher government. The public investment in interstate highways contrasted with the disinterest shown to rail systems - and they have largely withered in North America, leaving whole communities vulnerable should the private automobile become out of reach. The quest for a solution to the car, takes the author and reader through a intrepid search for an alternative: the electric car, hybrids, hydrogen power, and railways, before contemplating the future for air transport. The final chapter on energy looks at the oil industry: its relationship in particular with US governments, its dubious claims on new oil field finds, and the increasing lengths and ever more complex methodologies needed to exhume the dwindling supplies. The author quite rightly wonders "how we could all be so self-deluded as we pour billions of dollars, pounds and euros, into trying to recreate the very economic circumstances which got us into this mess". The answer of course is that alluded to in the introduction - the dominant social paradigm that mitigates against collective solutions. For all the dynamic creativity of capitalism is the contradiction - it leads to monopoly power, the removal of democracy over key questions of our lives and the resources they depend upon. How we get to this post-capitalist, post-oil dependent world is by no means clear, "the future is not some place we are going to but one we are creating. The paths are not to be found but made, and the activity of making them changes both the maker and the destination". There are no out-of-the-box solutions to this crisis. Those of us who fear the prospects for our societies if the "compressed changes" referred to are forced upon us need to start building and promoting alternative solutions now. If socialists and environmentalists fail, then the space will be vacated for the sort of neo-fascist movements like the Tea Party in the US: nationalistic, violent and angry. *Declaration: the author of The New Consumers, John Fisher, is also my uncle. Thursday's Morning Star reported that the Labour frontbench failed to back a Labour backbench amendment to the Finance Bill that would have forced the government to report on the feasibility of introducing the modest 'Robin Hood' Tax on financial transactions. Gregory Campbell (DUP), Ronnie Campbell (Lab), Jeremy Corbyn (Lab), John Cryer (Lab), Frank Dobson (Lab), Mark Durkan (SDLP), Jonathan Edwards (Plaid), Andrew George (LD), Kate Hoey (Lab), Kelvin Hopkins (Lab), Stewart Hosie (SNP), Elfyn Llwyd (Plaid), Caroline Lucas (Green), Angus MacNeil (SNP), William McCrea (DUP), Alasdair McDonnell (SDLP), John McDonnell (Lab), Andrew Miller (Lab), Austin Mitchell (Lab), Margaret Ritchie (SDLP), Angus Robertson (SNP), Dennis Skinner (Lab), Mike Weir (SNP), Eilidh Whiteford (SNP), Hywel Williams (Plaid), David Winnick (Lab) and Mike Wood (Lab). The question John McDonnell MP rightly asks is why the Labour frontbench has refused to support calls for Robin Hood Tax. Another opportunity to lead a progressive, popular campaign lost. As this was a Treasury issue, why did shadow Chancellor Ed Balls not back it? And why has Ed Miliband missed an opportunity to support this policy and place Labour back at the head of a progressive coalition? 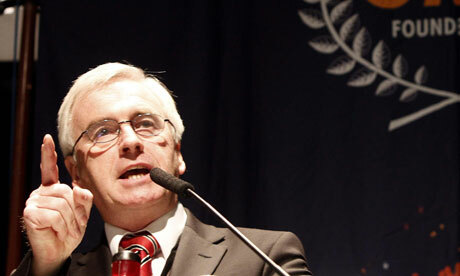 John McDonnell: I can think of no better day on which to debate this issue, having seen the pictures shown on our television screens last night and today of the tragedy that is taking place in the horn of Africa. This morning, Radio 4 broadcast the story of a family—parents with one child—who had walked for miles to the aid station, only to find that the one-year-old child had died as a result of suffering the drought and famine. I also commend last night’s “Dispatches” programme, presented by Jon Snow, which identified the activities of Rachmanite landlords in west London. Some of those landlords operate in my constituency, and the matter has been raised in the Chamber in the past. It demonstrates the poverty that still exists in this country. On a personal note, let me say that this morning I received letters from children at Cherry Lane primary school in my constituency as part of their campaign to encourage politicians to think about how we can fund education in the developing world so that children there can go to school. That is what my proposal is all about. When the transaction tax was relaunched last year as the Robin Hood tax, it was supported by a wide range of churches and religious organisations. I will not name them all, but let me give Members a flavour of them. They included the Trades Union Congress, Crisis, Action Aid, Article 12 in Scotland, Barnardo’s, the Catholic Fund for Overseas Development, Christian Aid, Church Action on Poverty, Comic Relief, the Church of Scotland’s Church and Society Council, the Christian Socialist Movement, the Disability Alliance, the Ecumenical Council for Corporate Responsibility, EveryChild, Family Action, Faith2Share, Friends of the Earth, the General Assembly of Unitarian and Free Christian Churches, Greenpeace, Oxfam, Quaker Peace and Social Witness, Save the Children, Tearfund and the Salvation Army. That was the largest alliance of civil society organisations that we have seen in generations campaigning on a single issue, and, as you know, Mr Speaker, they came here last month. Twelve hundred people came to Parliament, and met us in Central Hall over a cup of tea. The event was organised in particular by Oxfam, Action Aid, Save the Children, Tearfund, CAFOD and Christian Aid, and their message was simple: 1 billion people have no access to clean water and 2.5 billion lack basic sanitation, and it is time for change and action. As well as being evasive about what was up for negotiation, it was clear that either Maude hadn't read the Hutton report or was willfully trying to misrepresent it by saying pensions were getting more costly, and that Hutton had said public sector pensions were 'untenable'. Later in the day, other Ministers took to the airwaves and suggested that the Hutton report's projected falling costs was based on certain assumed changes that the unions were opposing, including the change in the inflation measure for indexation from RPI to CPI. It's therefore worth looking at the National Audit Office report, published in December 2010 (in between Hutton's interim and final reports) and does not take into account the indexation change, nor does it make any assumptions in the size of the workforce. It shows reforms agreed between the unions and the then Labour government in 2007-08 "reduces costs to taxpayers by 14 per cent". It also says, "long-term costs are projected to stabilise around their current levels as a proportion of GDP". So even without these disputed areas (which the government obviously aims to force through) the costs are still not rising, but stable. The 07-08 agreement is also "transferring from taxpayers to employees additional costs arising if pensioners live longer", which means savings are being provided by public service employees in form of increased contributions or reduced future pension. The 07-08 deal raised the pension age to 65 for new starters, introduced a career average scheme into the civil service pension scheme, and introduced 'cap and share' arrangements so that unexpected rises would be borne by employees. Labour Cabinet minister at the time, Alan Johnson MP, said it was a "fair and reasonable" deal. And so to the Labour Party and Ed Miliband, who was very clear (some might say repetitive) in his opposition to the strikes. However, in a briefing to Labour MPs 'PLP brief: Strikes and public sector pensions- 28 June 2011, From the Leader of the Opposition' Ed sets out Labour's position more fully (over 7 pages) yet no more clearly. "Lord Huton argued that public sector pensions in the UK are affordable in the long run"
"[The government is] switching the indexation of public sector pensions to CPI from RPI"
The above seems to counter Ed Miliband's line that negotiations are ongoing, and even the document hints at this by saying "If the government wants, they could have proper discussions. If that happens, there's no need for these strikes". This strongly implies proper discussions are not happening, undermining Ed's insistence that it's wrong to strike when negotiations are ongoing. Even Francis Maude was virtually forced into a confession of the sham nature of the talks under scrutiny from Evan Davis and Mark Serwotka (Radio 4 Today). Unions met with the government again this week (for the first time since 30 June), but little movement seems to have been achieved, according to this Reuters report. It is important that both the media and the Labour opposition begins to cut through the spin and misrepresentations and hold the government to account on this issue. It is even more bizarre for the Labour Party since, by tacitly supporting further changes, they are saying their own 2007-08 deal was ineffective, despite the National Audit Office proving the contrary. If there's one lesson of the banking crisis and bailouts of 2007-09, it's that 'you can't control what you don't own'. Today the government implores the banks to lend more to businesses and to constrain executive bonuses, but to little avail. Perhaps the irony is that we do still own large stakes in several banks. Indeed if it were not for the various guarantee schemes that underpinned UK banking, we would have ended up owning most of them as they fell like dominoes. However, the ownership model devised was arms-length, temporary, and was in reality the privatisation of public money rather than the nationalisation of private assets (or liabilities). The New Labour government had introduced the market further into areas such as welfare, education and health, had part-privatised the London Underground, and more of the civil service than the governments of Thatcher and Major combined. But here it was facing the possibility that its golden child - the finance sector - was about to collapse. In 2007, what struck LEAP was the lack of debate about public ownership. What really sent the message home clearly for me was this press release from Unite, the union that represents Northern Rock staff, from 20 November 2007. It sets out a six point 'Charter for Northern Rock' the sixth point is "To retain Northern Rock as a UK listed company". I don't use this example to in anyway demean Unite, but simply to highlight how little issues of ownership and control were being discussed and debated in the labour movement. Today, Southern Cross - which owns 753 care homes across the UK - remains on the verge of collapse. The 2011 GMB Congress asked 'If private equity and the private sector are places fit for the care of our elderly, our most vulnerable and our most dependant?' Indeed. A new debate is starting up about media ownership in the wake of the News of the World hacking scandal. With energy and supermarket prices both rising above inflation to enable gratuitous profiteering, the demand for public ownership should be made. Earlier this week it was also revealed that Virgin Trains received £40 million in public subsidy, and paid out nearly £35 million in dividends. The case for rail re-nationalisation is overwhelming. 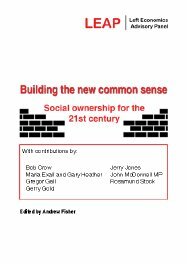 It therefore seems an opportune time to publish free online for the first time LEAP's 2008 publication Building the new common sense: Social ownership for the 21st century (you can buy a hard copy here). The pamphlet looks at different forms of public ownership from the Morrisonian post-war model to workers' co-operatives.